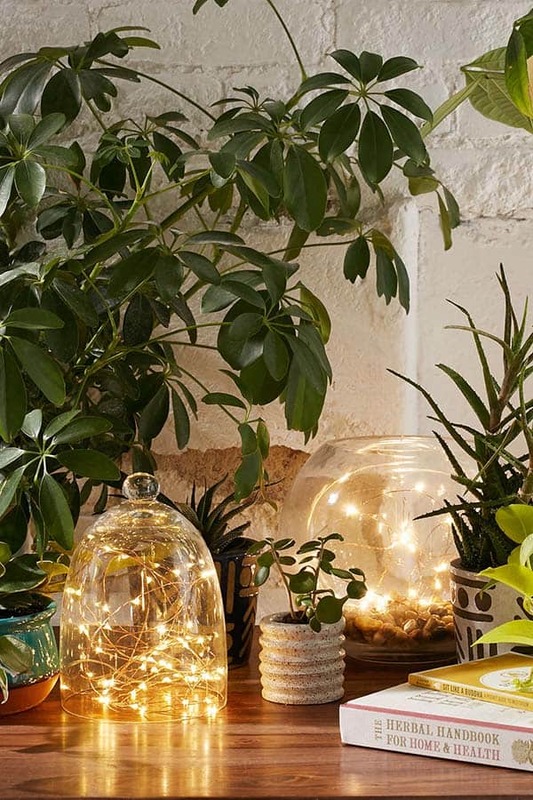 Add magical charm to any space by decorating with luminous string lights, they look fantastic indoors and out and can be used to decorate all year round. 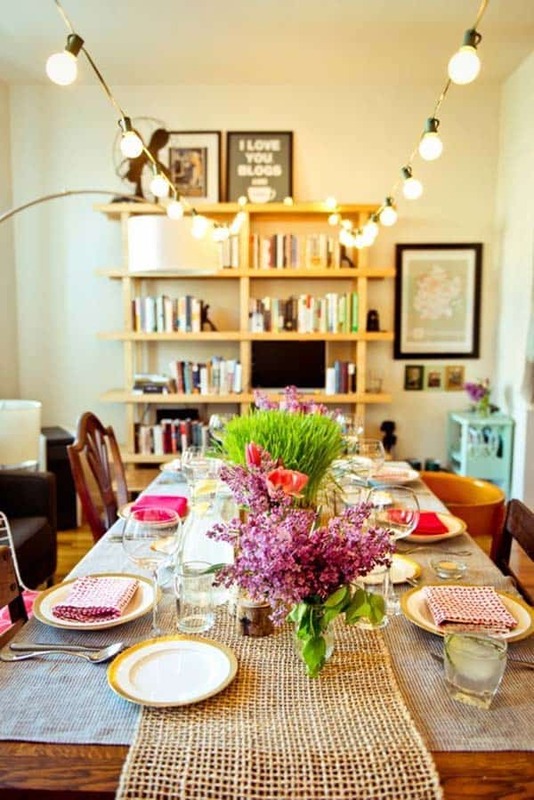 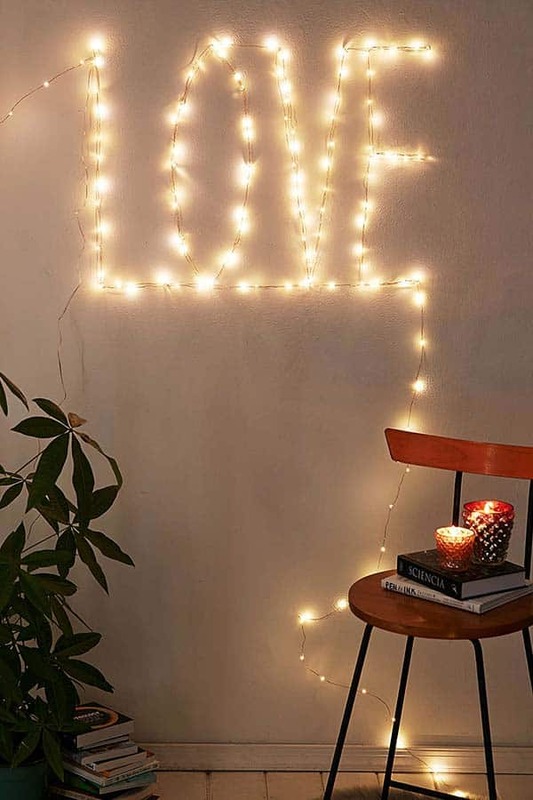 String lights create an ambiance that is warm, cozy and even romantic, they really help to set a mood and they are so many ways to decorate with them. 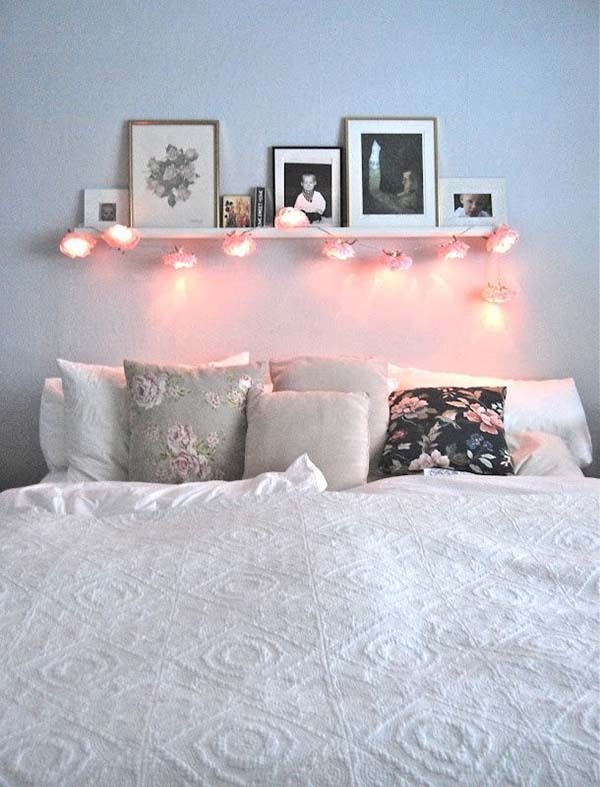 We love them for adding a hint of light to a headboard, wall, mantel, firebox, table centerpiece, trees, planters, railing, bookshelves, wrapped around a mirror or wooden ladder, strung from the ceiling, or even decorating an outdoor living space. 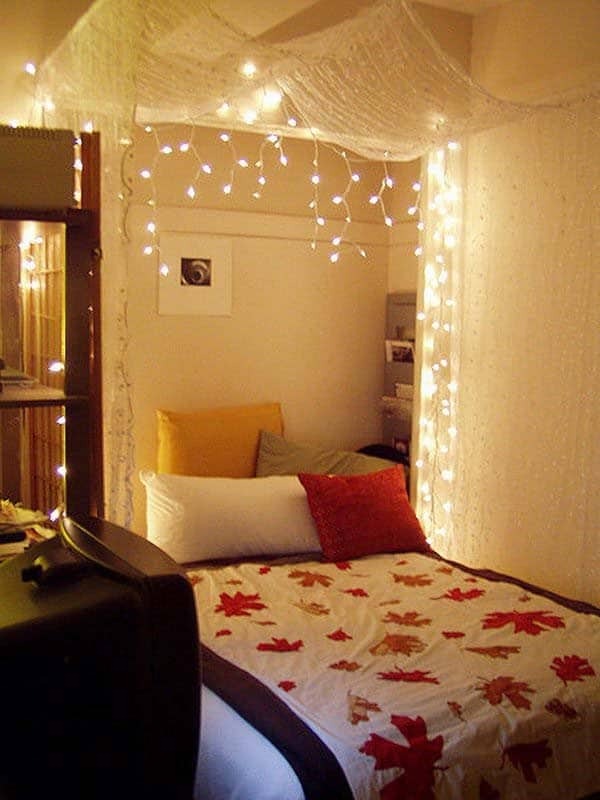 Fairy lights are also perfect for decorating small apartments and dorm rooms. 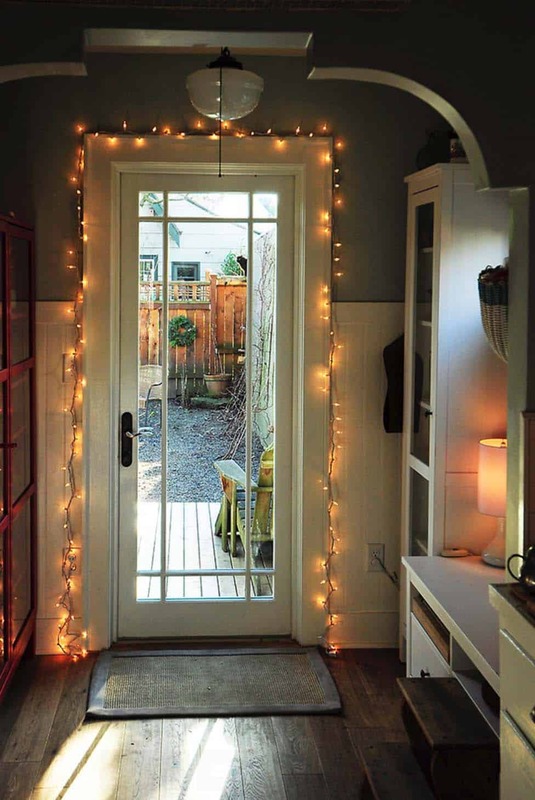 These fabulous lights can make your home glow long after the holiday are over, setting the mood during the evening and keeping a festive cheer all the way after the snow melts. 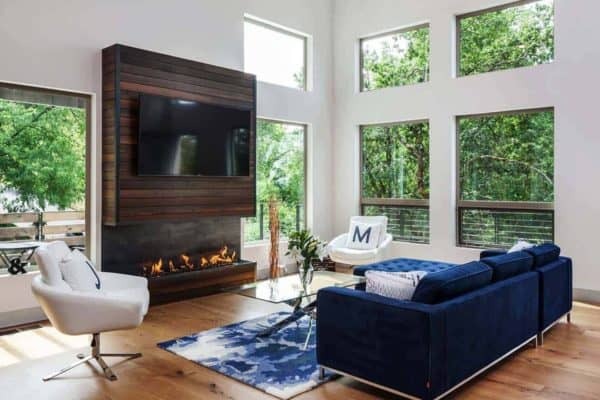 The latest LED lights offer great technological features such as timers and remote controls, making setting the mood even easier. 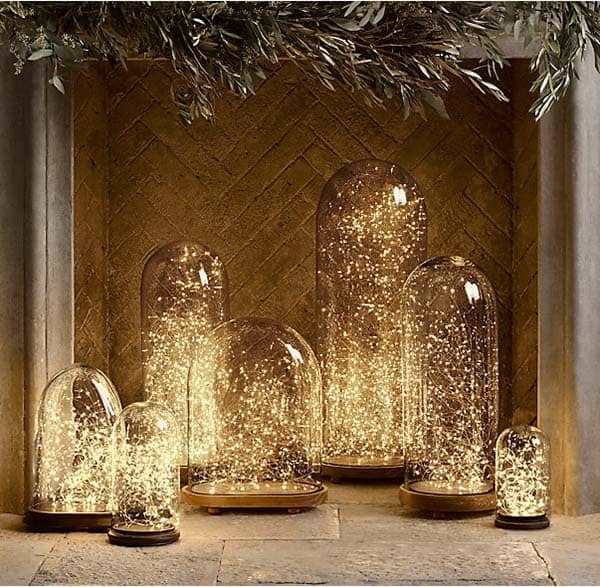 They burn more safely and they are looking more aesthetically pleasing then ever, so it would be wise to not store them away after the holidays and instead find some clever ways to brighten your mood all year round. 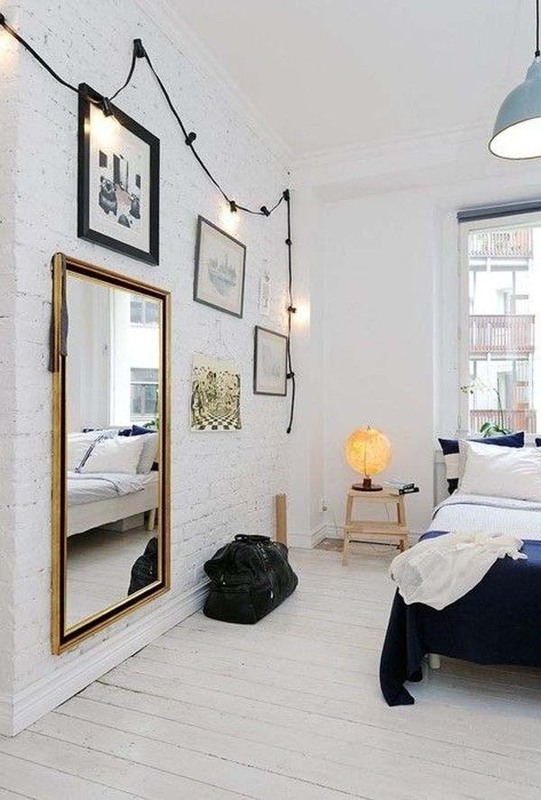 We have some fantastic DIY ideas for inspiration and with a little creativity, you can transform and ordinary space into one of enchanting one. 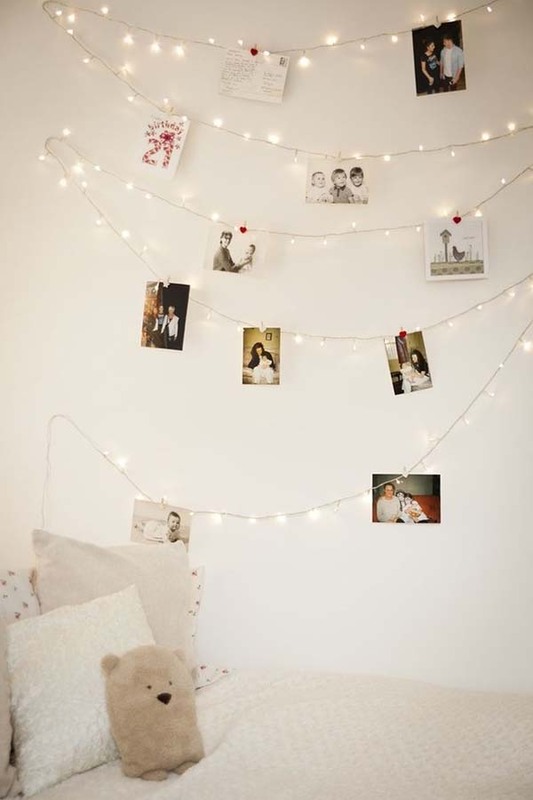 Be sure to let us know which image you find most inspiring! 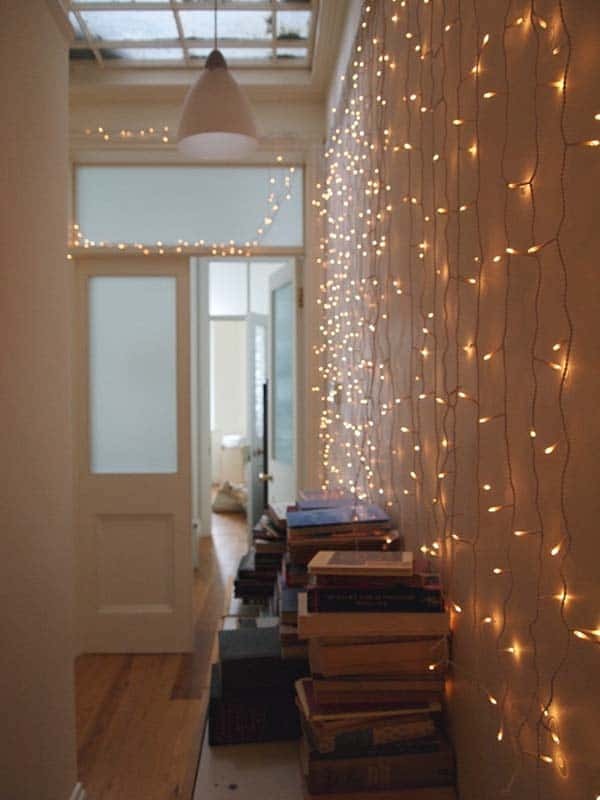 Decorate a window filled with luminous fairy lights. 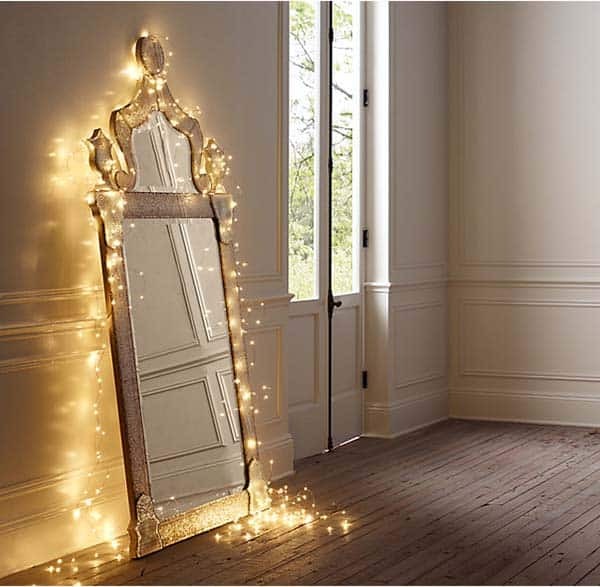 Not only does a mirror make your room feel bigger, but adding some twinkle lights to highlight it creates a special effect. 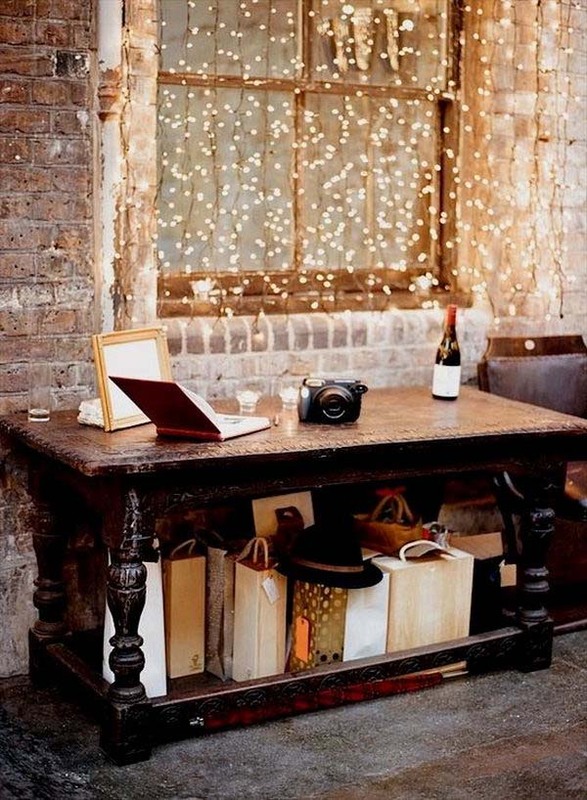 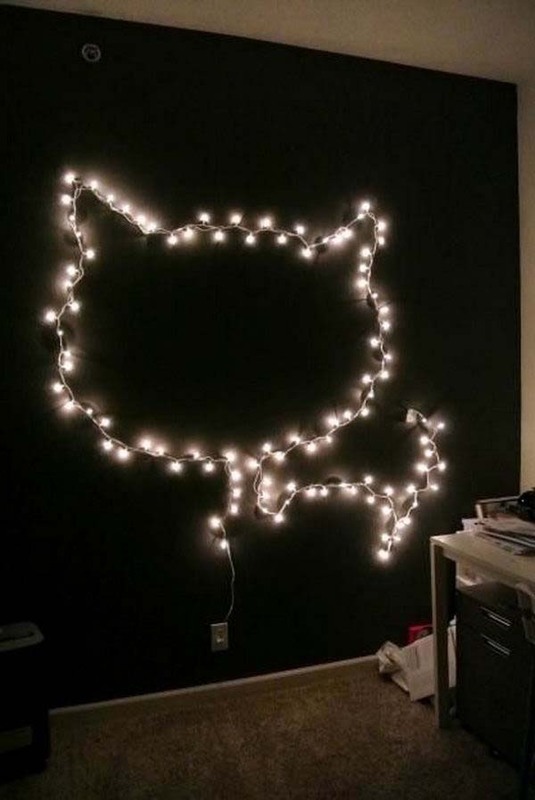 Create an inspiring workspace illuminated with string lights. 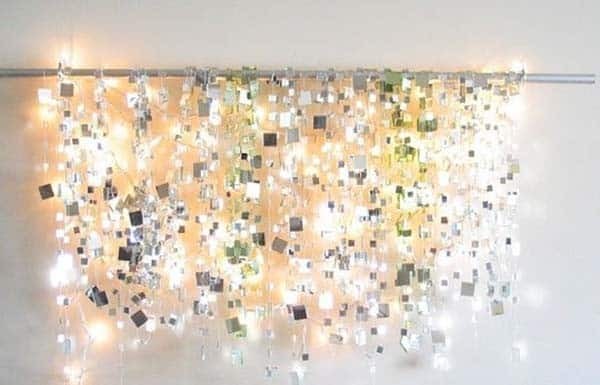 In the picture above, the lights frames the space, very fun! 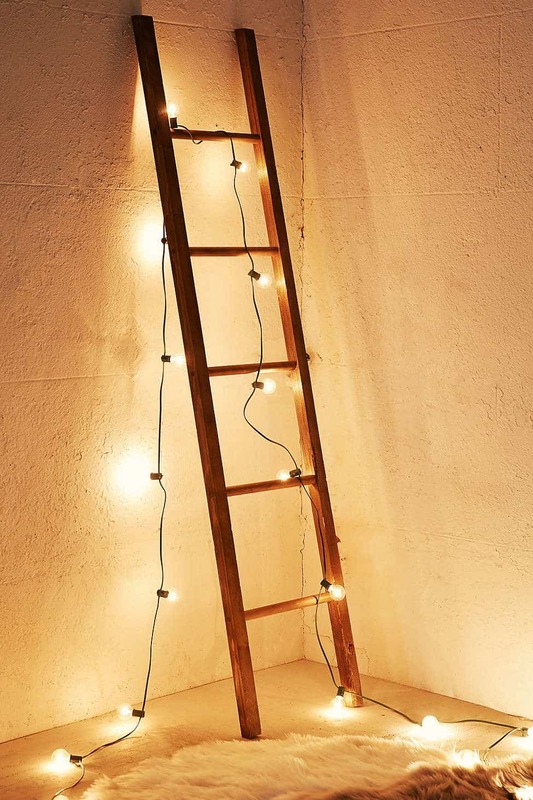 Add a ladder with string lights to any wall space. 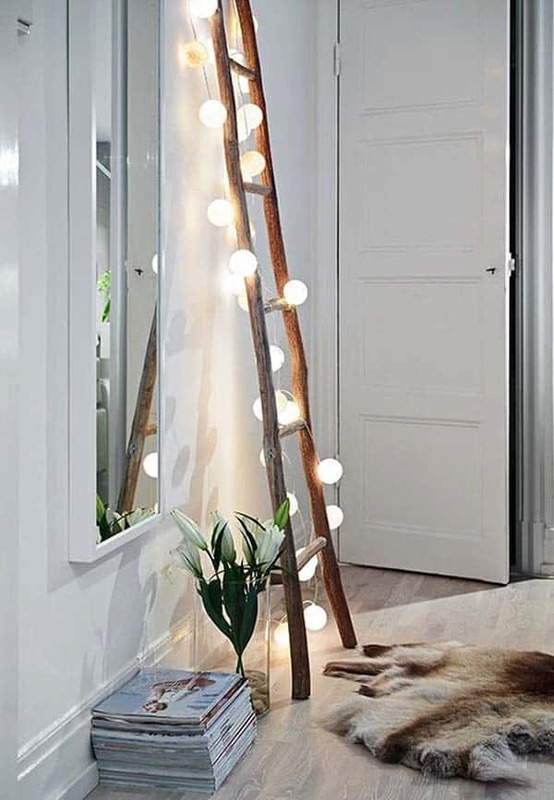 It creates a unique look and can virtually replace a lamp… not to mention it is so much more fun if you are looking for a statement piece! 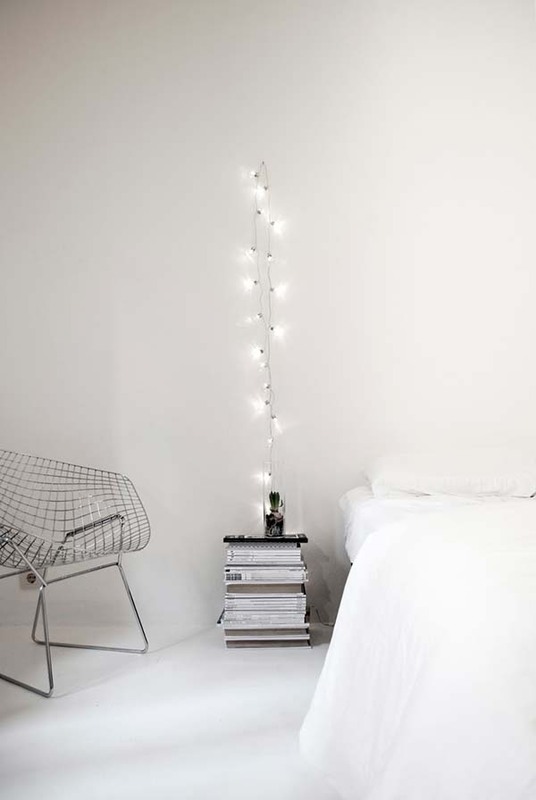 Hang a string light next to your bed to use in place of a bedside table. 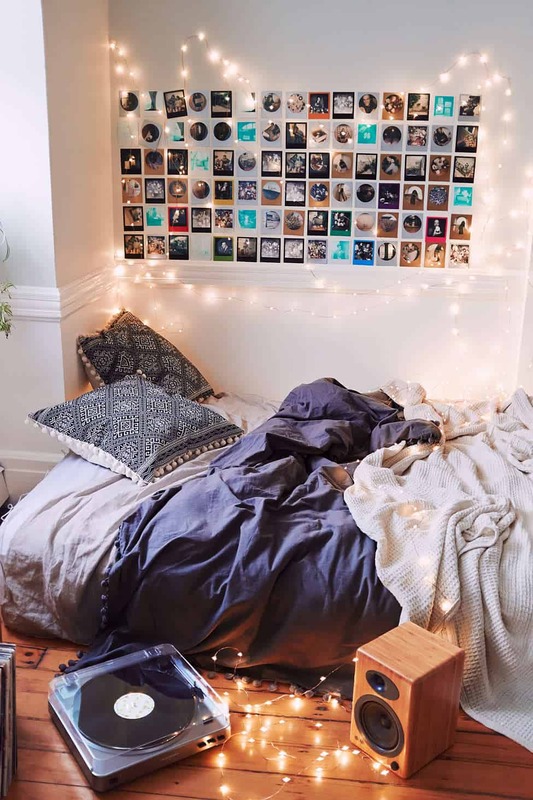 It creates a cool DIY look and is perfect (not to mention budget-friendly) solution if you don’t have an outlet next to your bed. 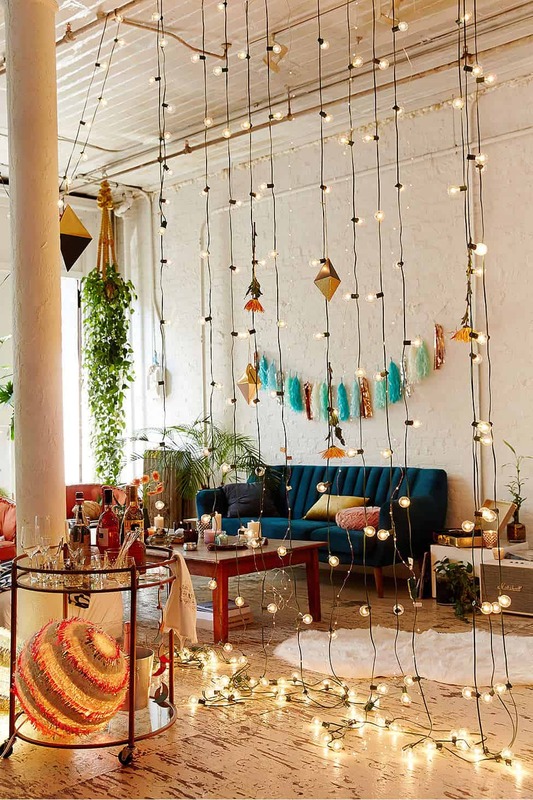 Add a touch of playfulness to your living room by affixing a light string from the ceiling, traveling down to the floor. 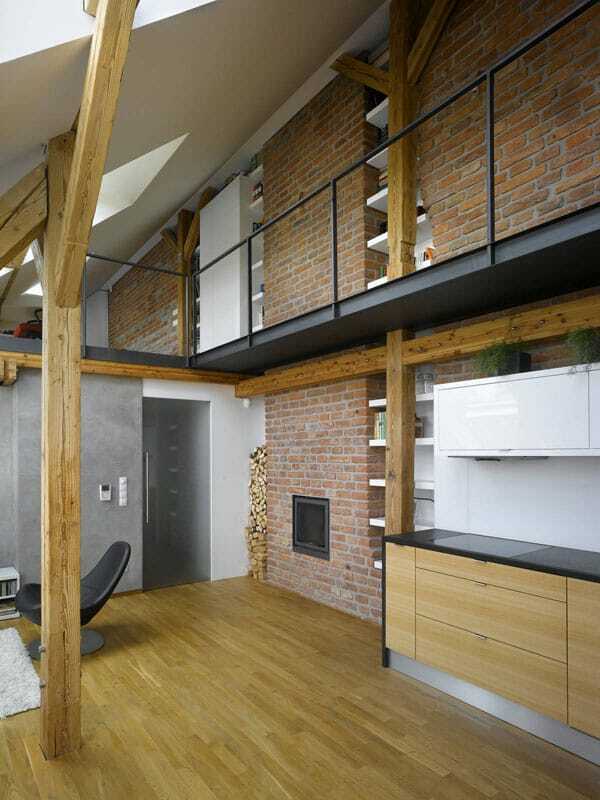 Simple, modern and fun! 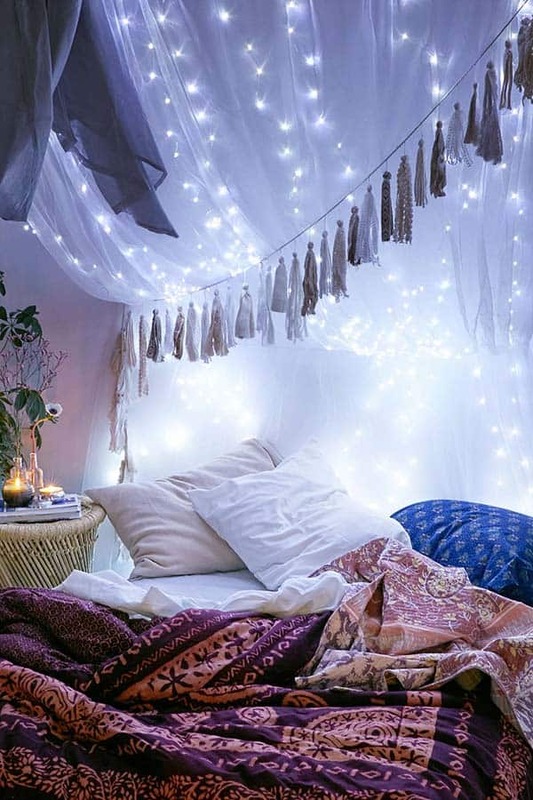 … and sets some awesome ambiance during the nighttime! 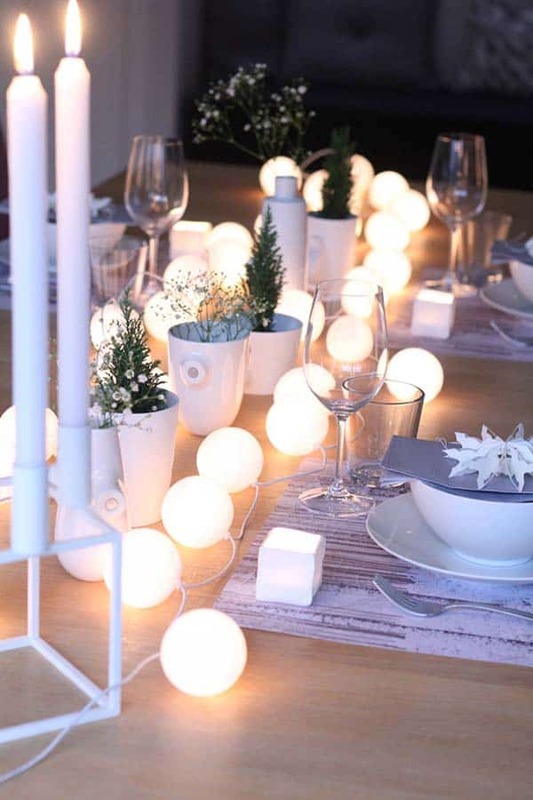 Strings lights illuminating your dining table not only creates a unique statement (this look is something you would typically see outdoors), it is a perfect solution to not having to install a light fixture above your table is there is not already something there. 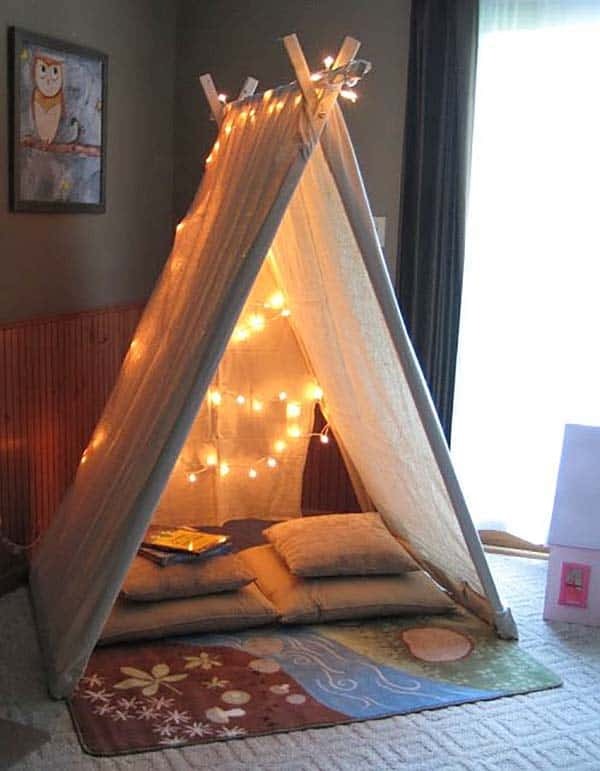 A sweet little reading nook lit up by string lights! 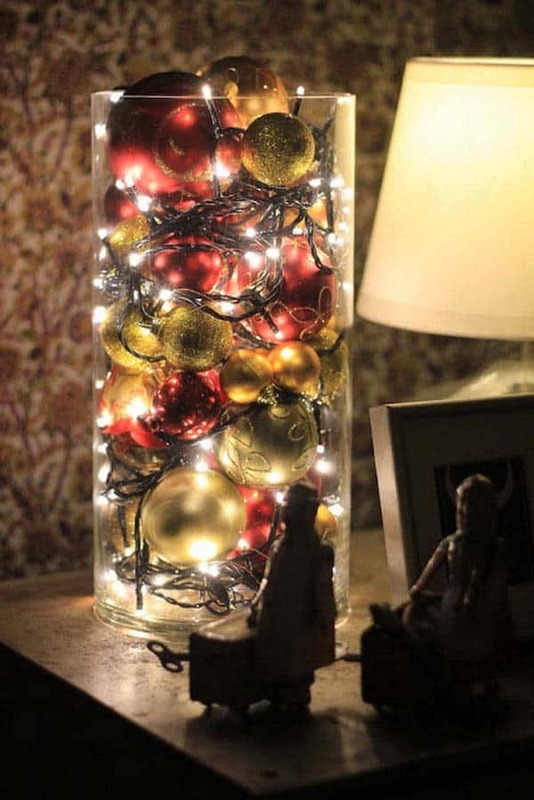 Old Christmas ornaments can be given a new life by adding them to a glass vase with fairy lights. 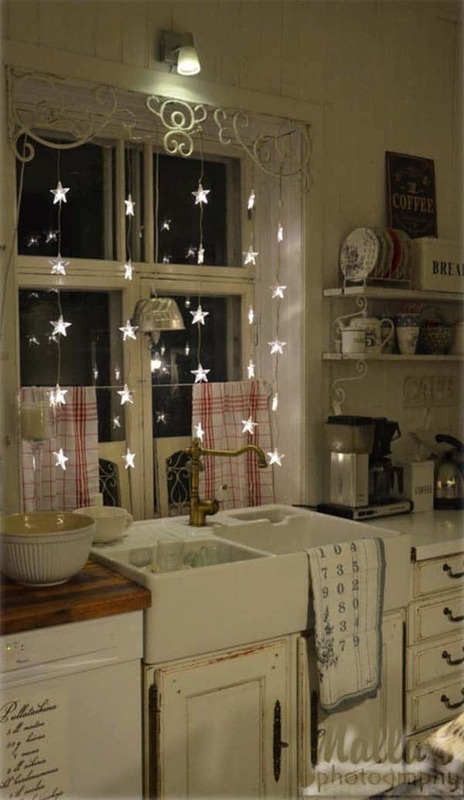 These puffy hanging clouds decorated with fairy lights make the perfect statement light fixture to really dress up a dull space. 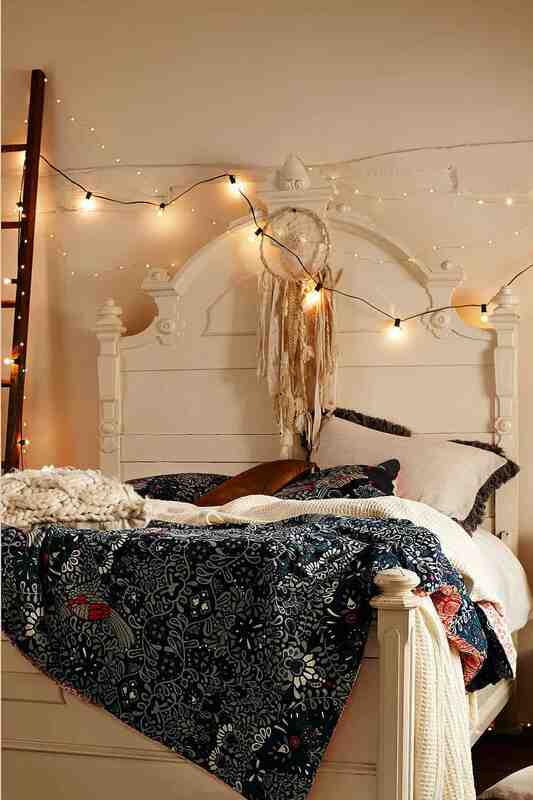 Would look amazing in anything from an apartment to a children’s bedroom. 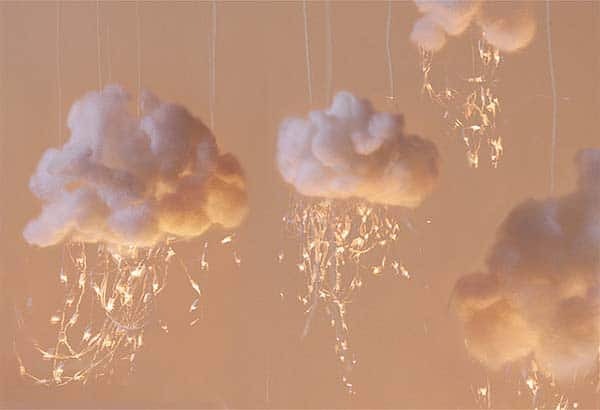 The suspended art pieces are comprised of Polyfibre fill, LED Lights and Lambs Wool. 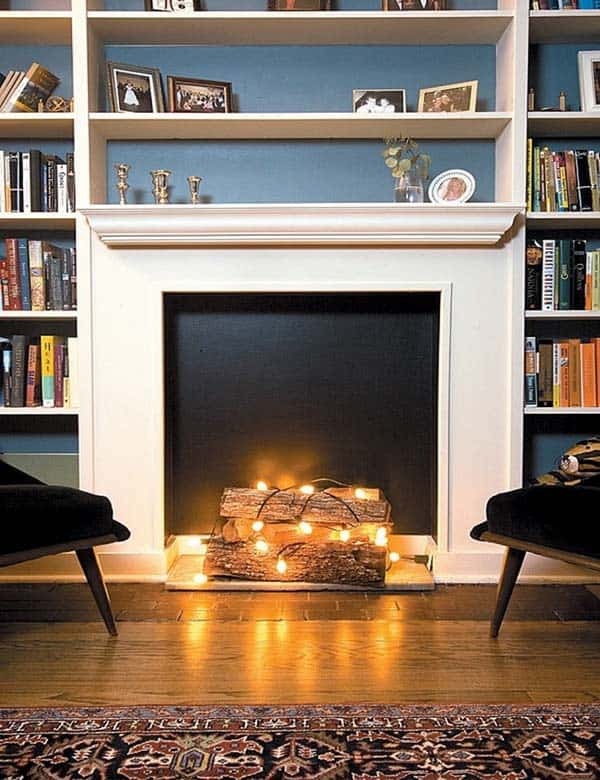 Make a non-working fireplace look visually intriguing by adding string lights to a stack of firewood. 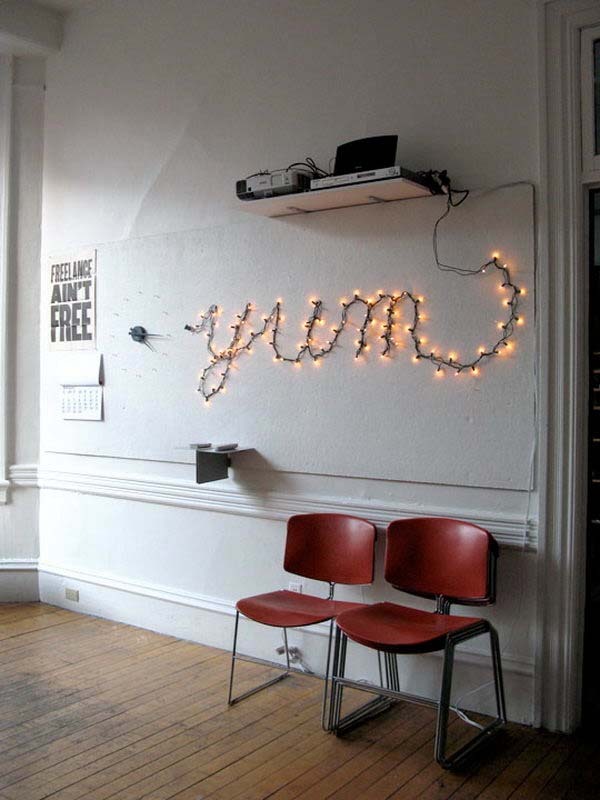 We love this novel idea! 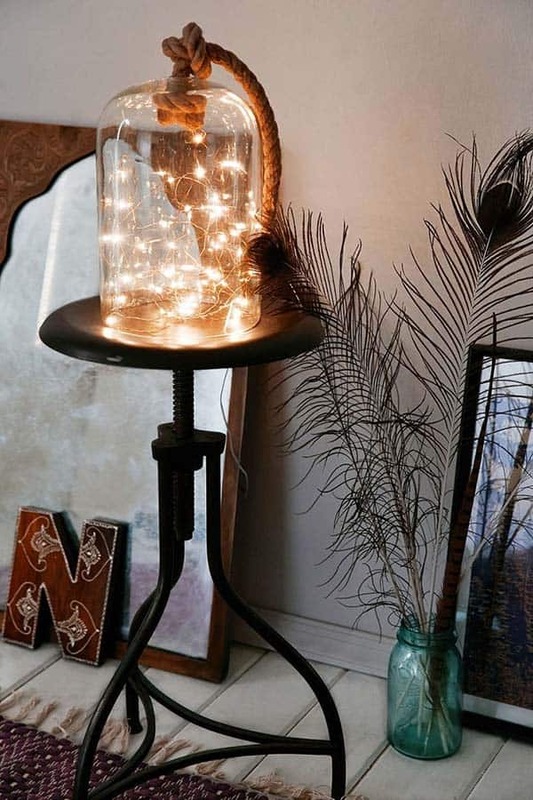 It creates a nice ambiance and would look really great when the lights are turned off! 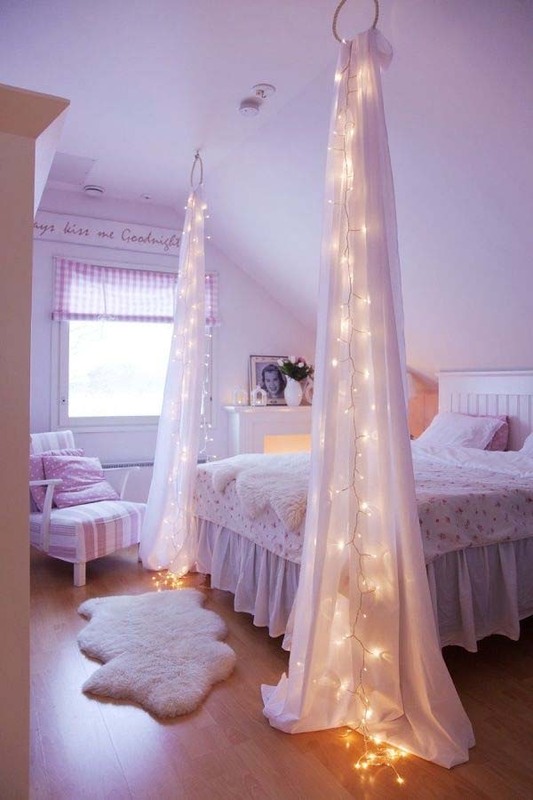 Integrate your fairy lights into suspended drapery accenting the end of your bed. 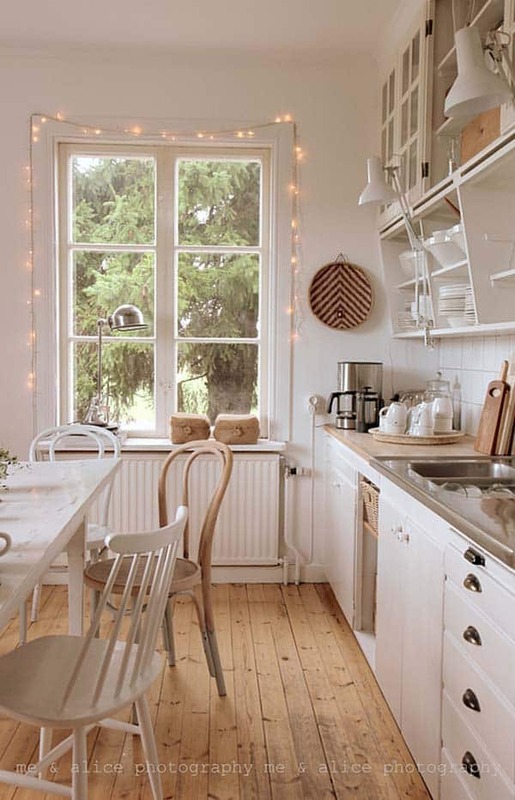 You can pull of this look by installing a round towel bar from the ceiling. 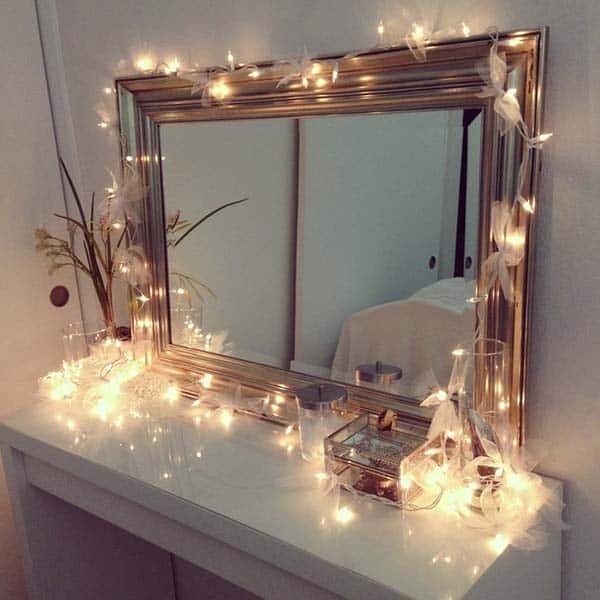 Fairy lights can be battery operated and you may want to even consider getting the ones on a timer so that they only stay on for a certain period of time so you don’t forget to turn them off! 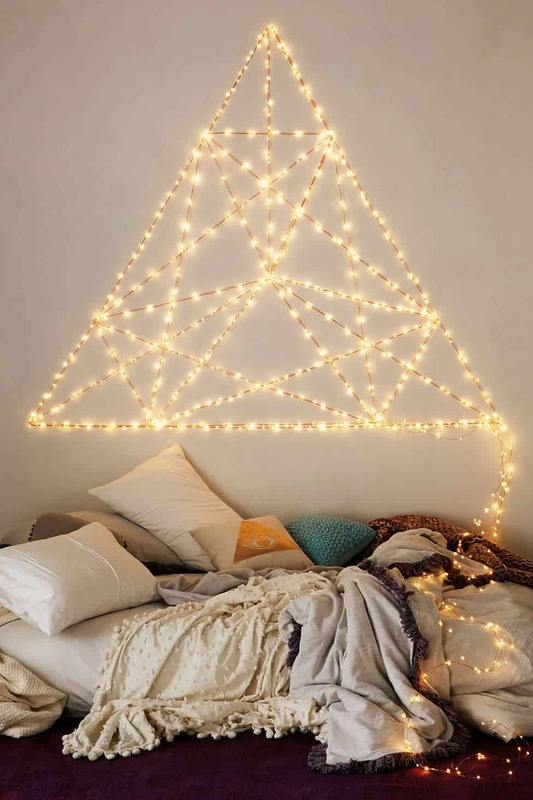 Another alternative to decorating a non-working fireplace. 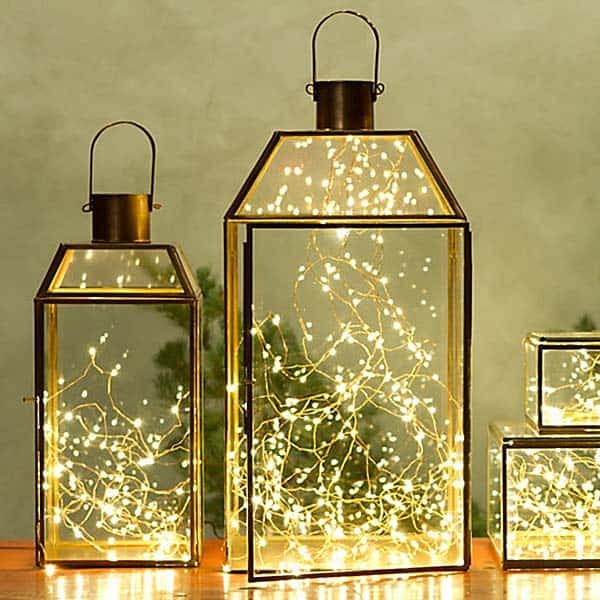 Try using fairy lights that are not only on a timer, but also with a remote control and place them into a clear glass container. 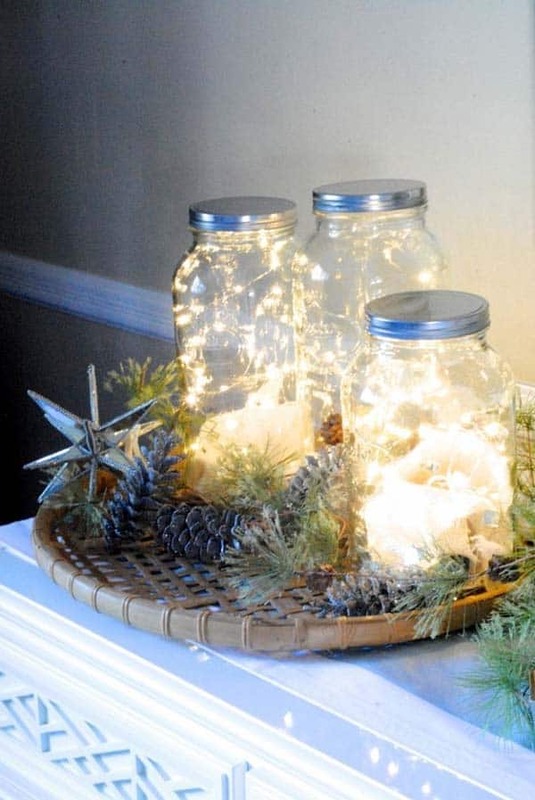 Decorate your fireplace mantel with decorative objects and mason jars filled with fairy lights. 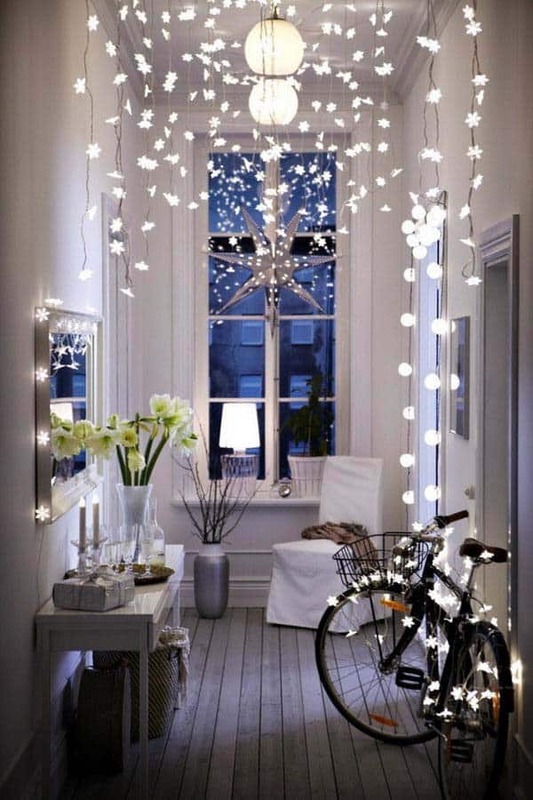 Winter Sparkle Mirror Garland and White Lights: Add a little light and sparkle to take some gloom out of cloudy days. 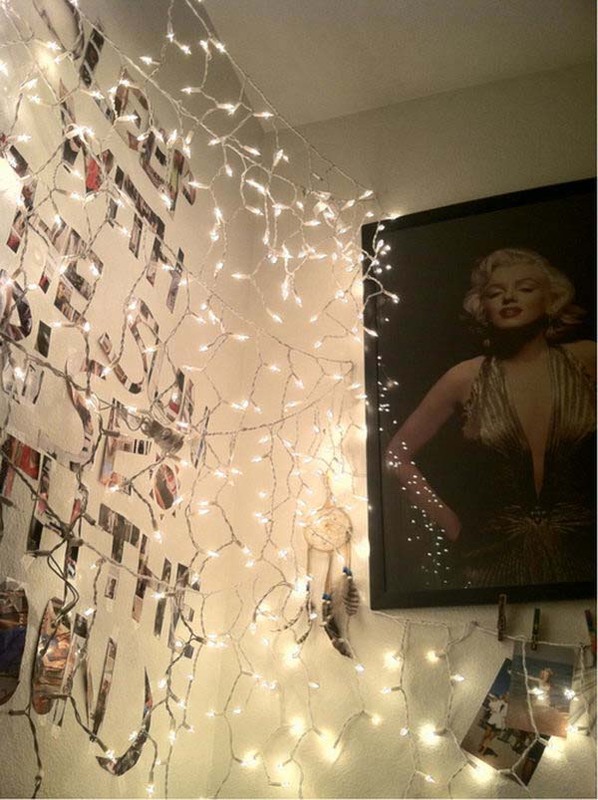 This DIY piece uses a strand of white fairy lights and yards upon yards of mirror garland. 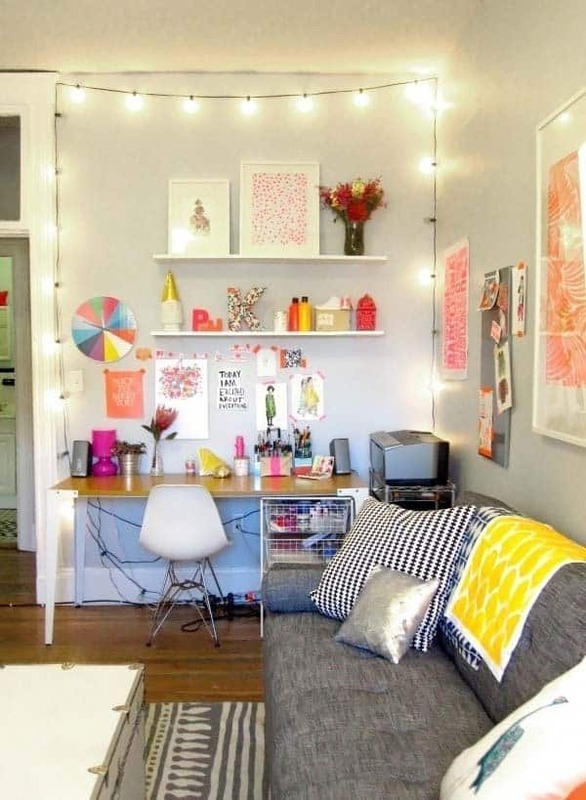 Check out further instruction on Apartment Therapy to create this interesting wall piece. 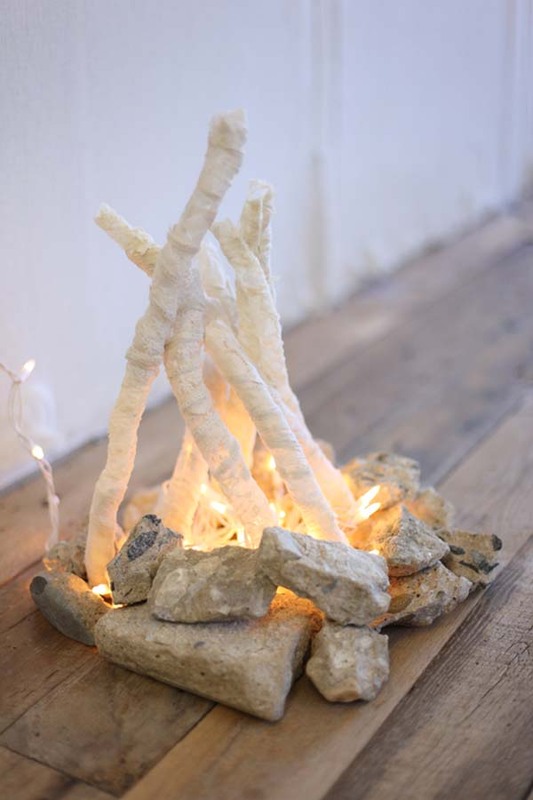 Create your own little indoor campfire with some clever DIY skills. 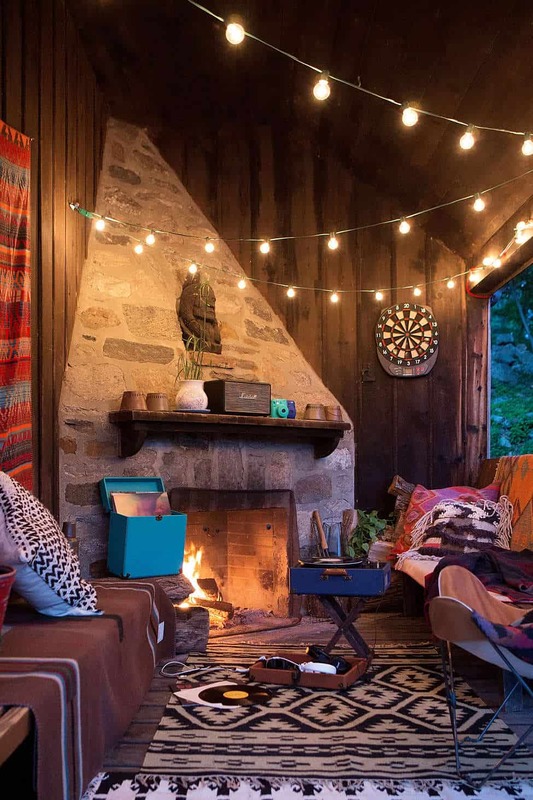 This flameless fire pit will sure to be an eye pleaser and neat little novelty. 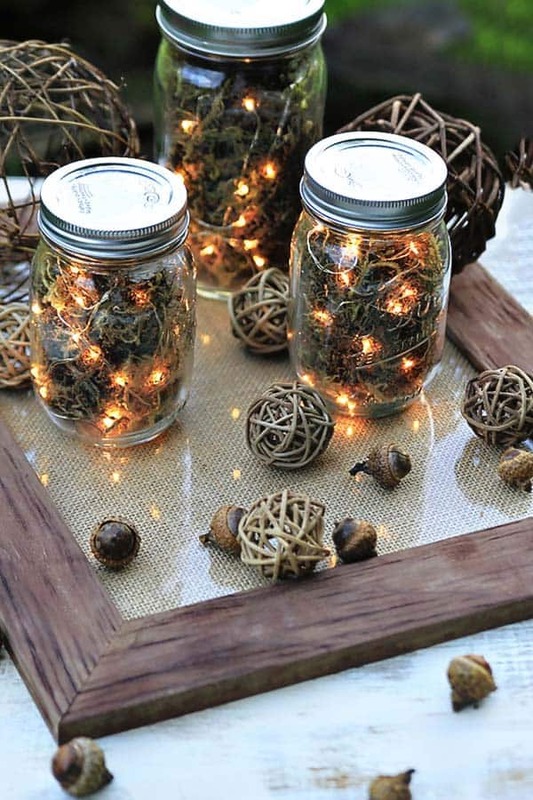 All you need is some lace ribbon, tree branches, aluminum foil, washable glue, paintbrush, string lights and some rocks (courtesy of nature). 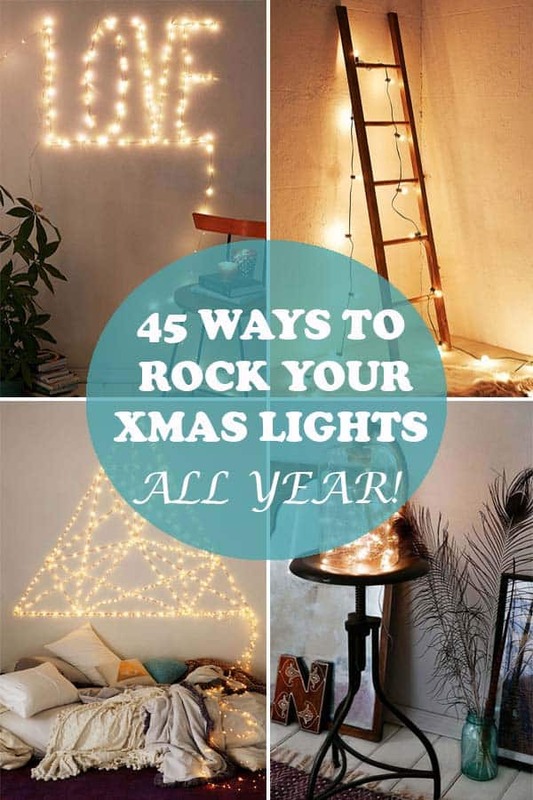 To see the full instructions, have a look at the Free People Blog. 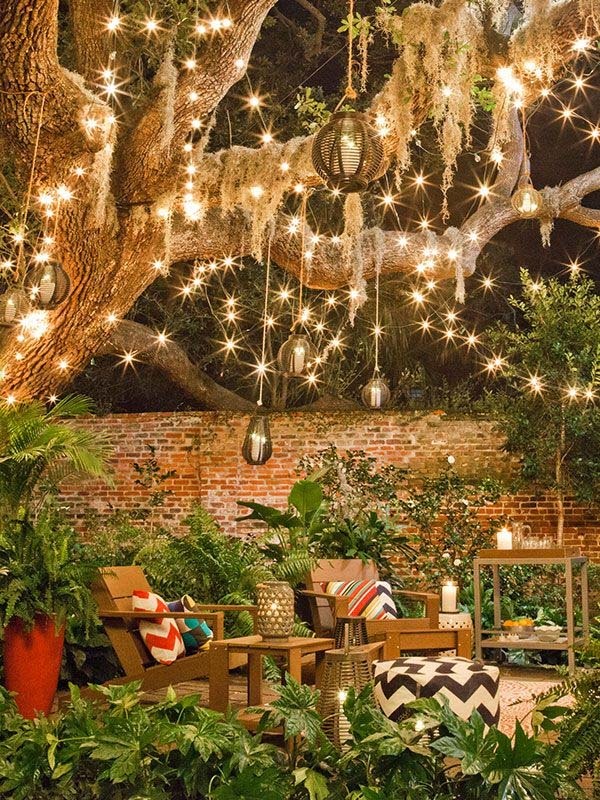 Take it outside and make your outdoor space shimmer with fantasy lights dangling from trees. 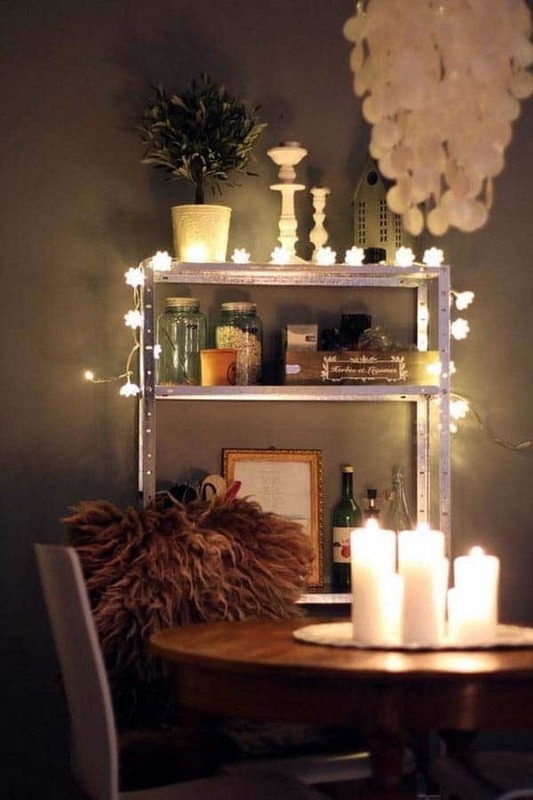 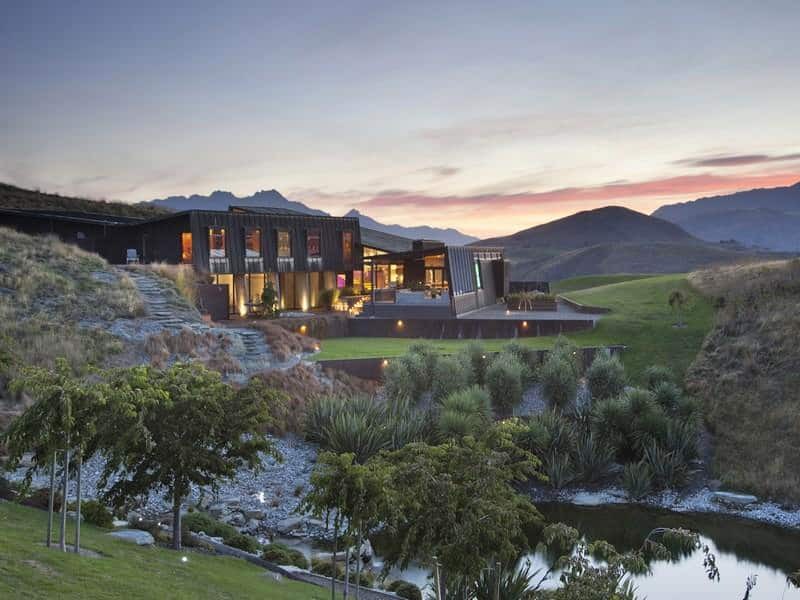 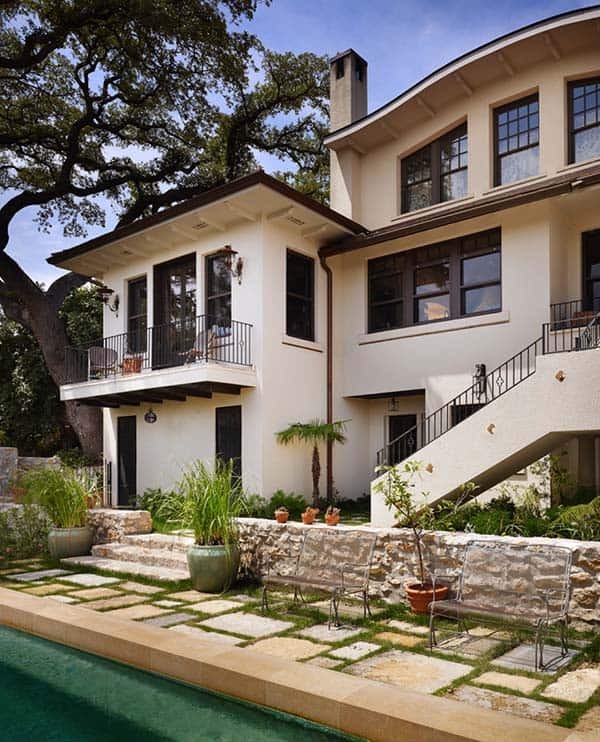 It creates a nice ambiance and a relaxing place to chill with a glass of wine and great conversation.